Baneberry Perennial For Sale - Low Prices Online Today. Baneberry - Actaea spicata. Baneberry plants are perennial and herbaceous. They tend to be bushy with large, feathery-like leaves and they prefer to grow in moist soils and partial shade, full shade, or full sunshine. They are native to Europe, Asia, and North America. They are 1 1/2 feet to 2 1/2 feet in length, and they spread 2 to 3 feet. Blooming times are usually from May to June, and their hardiness zones are from 3 to 8. There are two types of Baneberry: the Red Baneberry (Actaea rubra) and the White Baneberry (Actaea pachypoda). Baneberry Plant is native to North America. This plant enjoys moist soil. This plant blooms from May to June. The leaves of the baneberry plant have a beautiful appearance that resembles the appearance of mint. The flowers of the plant are white, and when the berries are formed, they are a lovely raspberry color that is sometimes used to make dye. This plant is most generally found in wooded areas. This plant blooms in Spring and Summer. When the fruit is born on the plant, it has small black dots on it which also gives the plant the name "dolls eyes." There are different varieties of this plant. There is the red version of the plant, and there is another version of the plant that is white. Each plant bears a different colored fruit. Baneberry Plant berries are very beautifully colored with a dark reddish color or a strange white color that is unique, with the stems connecting the berries to plant in such a geometrically exciting way. 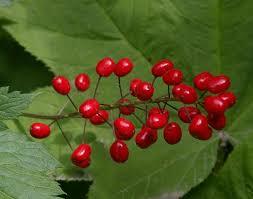 This plant is a surefire way to bring nature into the garden because the berries on it are edible for wildlife. This plant is natural to grow and has quite a long life. The berries are gorgeous, and the plant acts as a cover for the ground when needed. The baneberry plant also pairs very well with ferns and many other types of wild plants that are found in wooded areas. This plant can also be placed with others that are of its kind to cover more ground and give a tremendous lush impact.